Form with Flowers in the Alpine House at Wisley. Clump-forming Allium cernuum is native to North America, mainly the Allegheny Mountains and grows in dry woods, rock outcroppings and prairies. The bulb is edible and has a strong onion flavour. "This delightful species of ornamental onion has very narrow leaves and produces loose umbels of nodding, long-stalked, purplish-pink flowers in early summer. It naturalises easily making attractive drifts without becoming a nuisance. It is also known as "nodding onion" and "lady's leek" This plant is native to North America from New York to British Columbia south to Virginia and Kentucky, and south in the mountains, where it grows in dry woods, rock outcroppings, and prairies. The bulb is edible and has a strong onion flavour. "One of the prettiest species with lilac-rose, bell shaped flowers, held in loose, pendulous clusters, later becoming erect as seeds ripen. Height 35cm (14")" from R.V. Roger, who sell the bulbs. Tolerates dry soil and shallow rocky soil. Best in sandy loams. Plants will naturalize by self-seeding and bulb offsets in optimum growing conditions. Deadhead flowers before seed sets to help control any unwanted spread. Foliage persists past flowering into late summer before dying back. It occurs primarily in rocky soils on glades, bluff edges, open woods and slopes in the Ozark region of the State. All parts of this plant have an oniony smell when cut or bruised. Use in Rock gardens, border fronts, cottage gardens or naturalized areas." from Missouri Botanical Garden. "The preference is full to partial sun, moist to mesic conditions, and soil containing black loam, sand, or rocky material. While this plant can survive hot dry summers, it does better with more moisture. Foliar disease is rarely a problem. This plant is easy to grow under cultivation, and it will spread gradually under suitable conditions. It is easier to establish plants by transplanting the bulbs of offsets, rather than by attempting to germinate the seeds. Nodding Onion is an uncommon plant that occurs only in NE Illinois, where it is native. Habitats include black soil prairies, sandy pannes, and thinly wooded bluffs." from Illinois Wild Flowers. "One of our North American native wildflowers, this ornamental onion is an easy and reliable plant for edging the border, the rock garden or lightly shaded woodland. 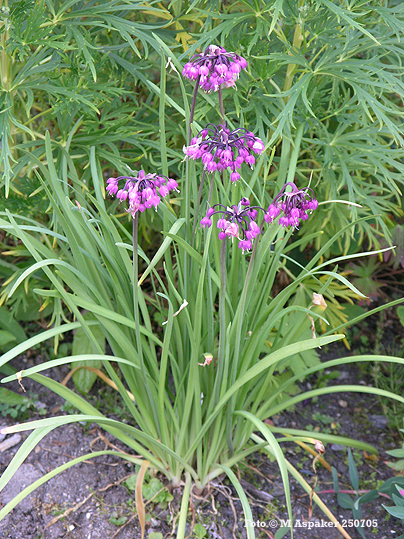 Plants form a low grassy clump of leaves, bearing upright stems with nodding clusters of soft pink to lilac flowers in early summer. Nice for cutting. Clumps may be easily divided in early spring or fall. Self-sown seedlings may also be moved while still small. Flowers are attractive to butterflies." from Heritage Perennials. Plant-World-Seeds for rest of the world. Buds and Flowers in the Alpine House at Wisley.